451 Research’s latest Voice of the Enterprise: Servers and Converged Infrastructure indicates that while 49.4% of enterprises are undergoing IT transformation initiatives, which often include migration of workloads to cloud, server spending remains steady. However, many IT buyers note that their server vendors could work to better understand customers’ businesses, which is an increasingly important factor with cloud and low-cost infrastructure underpinning software-defined IT environments. "There is a clear opportunity for server vendors to guide customers into next-generation technologies while preserving their current distribution of standard infrastructure," said Christian Perry, Research Manager and lead analyst of 451's Voice of the Enterprise: Servers and Converged Infrastructure service. "To seize this opportunity, vendors must work more closely with customers and prospects to understand current and future business requirements." In fact, when customers were asked to rate their vendors both prior to purchase (Promise) and following implementation (Fulfillment) of traditional servers and converged infrastructure, cost and the ability to understand customers' businesses consistently ranked lowest compared to other rating attributes. Meanwhile, product-specific attributes received consistently high ratings for both the Promise and Fulfillment indices. In a heavily commoditized market, vendors that differentiate on services and support –which is also a critical future driver among server buyers – will win. 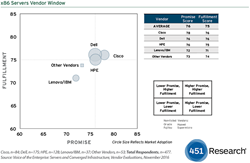 The x86 Servers Vendor Window shows tight competition among Cisco, Dell and HPE. 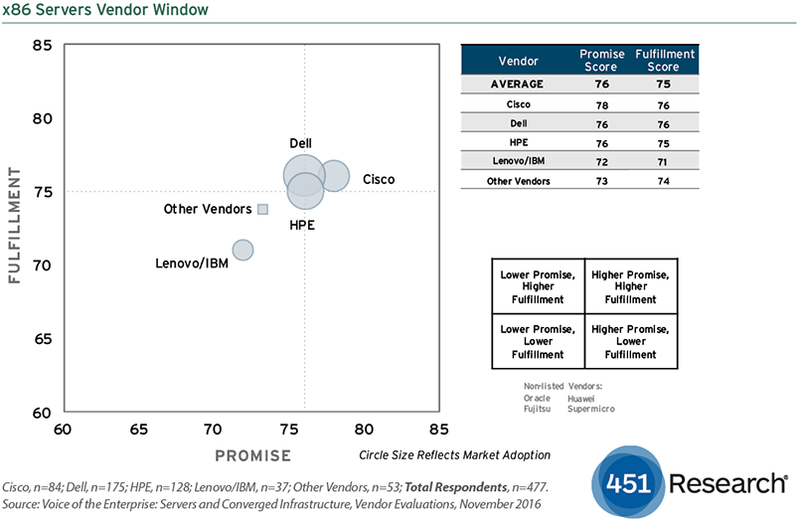 All three garnered strong ratings from customers, with Cisco outranking competitors in multiple Promise and Fulfillment attributes, including Reputation, Long-term Viability, Product Performance/Capabilities and Technical Innovation. However, it fell short compared with Dell and HPE in Cost for both Promise and Fulfillment. Lenovo received below-average ratings across multiple attributes, but scored well for Long-term Viability and Product Performance/Capabilities. "As compute infrastructure choices expand beyond traditional servers, customers are more critical than ever about their x86 servers because they must provide a better ROI than competing x86 servers, cloud services and converged infrastructure," Perry said. 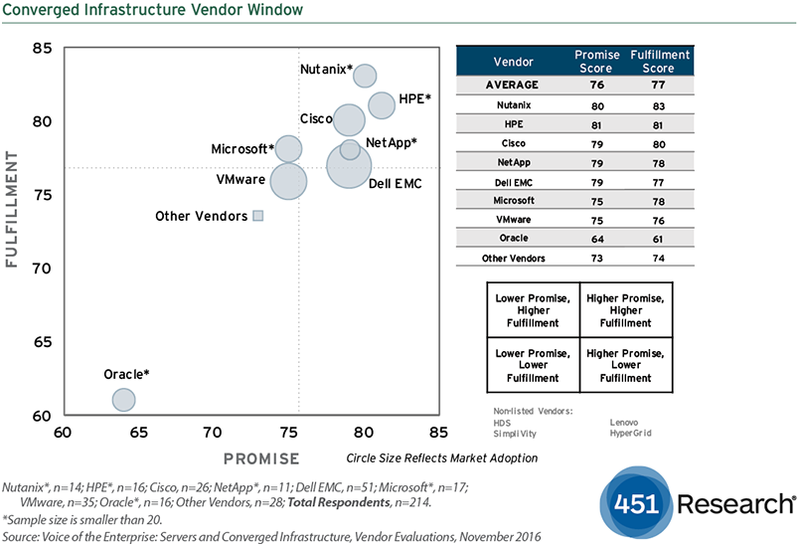 In converged infrastructure, Nutanix earned high customer ratings across most attributes, but was followed closely by HPE and Cisco. Particularly impressive about Nutanix is that all but one of its Fulfillment ratings exceeded its respective Promise ratings (and the lone holdout, Long-term Viability, matched the Promise rating). Along with Nutanix, HPE, Cisco, Microsoft and NetApp all received above-average scores for Fulfillment. Two attributes in converged infrastructure lagged all others by a large margin across both Promise and Fulfillment: Understands My Business and Cost. While converged infrastructure might fit more strategically within the IT plans for some organizations, it appears that the vendors selling the infrastructure are selling primarily from a transactional basis, rather than a strategic IT basis. For customers that purchase converged products only to satisfy project requirements, this approach is probably adequate, but customers displacing large portions of their legacy server infrastructure tend to prefer vendors that understand the businesses of customers in disparate verticals and regions. The Voice of the Enterprise: Servers and Converged Infrastructure - Vendor Evaluations study plots enterprise adoption, Promise and Fulfillment indices that compare the perceptions of vendors’ promises prior to actual product/service delivery against execution effectiveness. Based on research conducted in October 2016 with more than 730 IT professionals worldwide, the quarterly study combines 451 Research's analysis with survey responses and in-depth interviews from a panel of more than 50,000 senior IT buyers and enterprise technology executives. 451 Research is a preeminent information technology research and advisory company. With a core focus on technology innovation and market disruption, we provide essential insight for leaders of the digital economy. More than 100 analysts and consultants deliver that insight via syndicated research, advisory services and live events to more than 1,000 client organizations in North America, Europe and around the world. Founded in 2000 and headquartered in New York, 451 Research is a division of The 451 Group.